We used the beautiful tradtional papers from the Helz Cuppleditch Wonderland collection with matching embellishments for this design, but you could get creative by using different papers and colours. Design Team member Lyndsey (CraftyBlonde) takes you step by step through this festive project below, and we’ve also provided a paper folding diagram for you to follow to make this super easy to create! 1. Take a piece of 6” x 6” paper and fold it in half diagonally both ways. 2. Next, take each corner and fold into the middle, as shown below. 3. Turn over the paper and measure 2.5cm from the middle along each fold line and mark with a pencil. Cut the paper from the outside edge to the 2.5cm mark. 4. Fold each edge in towards the marked line, as shown below. Tip: We drew a pencil guide diagonally in the centre of each square so we could fold the edges in towards this guide. Stick these folds down to hold the paper in shape. 5. Repeat this process to make another star shape. Overlap the two finished shapes and adhere together as shown. 6. Decorate both sides with Christmassy embellishments and punch a hole in the top of your decoration in order to thread a ribbon through – now you’re ready to hang your fancy star decoration on the Christmas tree! There are so many ways to use this star design! 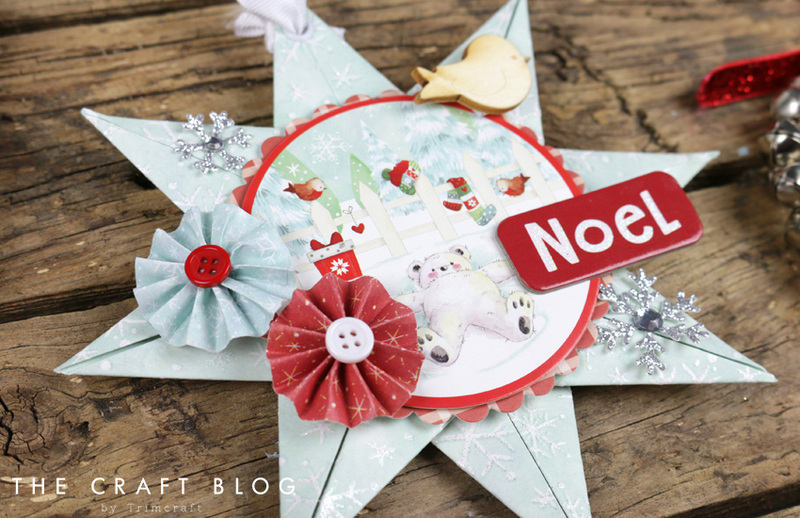 How will you use this star fold Christmas decoration tutorial? We would love to see, so remember to upload your designs to the Inspiration area and to #trimcraft when uploading to social media. This is brilliant Lyndsey, will have to give it a try. WOW this is amazing. I remember we made these, when I were a lot younger, but had almost forgot about them, but now I´m definitely goiing to make some here again. They look fabulous, thanks sooo much for the reminder.